As many of you already know, our family has a big change on the horizon. In March, we are moving to Atlanta. Even as I type these words, the impact of this transition has not begun to hit me. We are incredibly grateful for our time in Virginia Beach and how the Lord has grown and shaped us over the past 6.5 years. Although we are excited about the next step God has revealed to us with such abundant peace and resolve, we will surely miss our beloved friends and family here who have truly carried us through the trials… lending faith when ours was weak, bringing meals when even a small trip to the grocery store seemed an enormous task, patterning and volunteering countless hours with John’s therapy, missing Warren with us, celebrating Warren with us, believing in John’s healing, praying with and for us, believing in our family, having confidence that our family was not broken but a beautiful unit in which to bring another child… all in all, just standing in the gap for us. Thank you, dear friends, for your devotion. We will leave Virginia with a deeper knowledge of the Lord, having experienced Him to be the One in whom we live and move and have our being through the love and grace shown by our many “neighbors.” As these verses in Acts 17 indicate, God is sovereign. With our times in His hands, He has determined our courses and the exact places we are meant to live. Why? So that we might reach out for Him and, in that reaching risk, realize He is near. Learning with widened eyes that the risk would yield the safest footing we could ever encounter. What a gift. 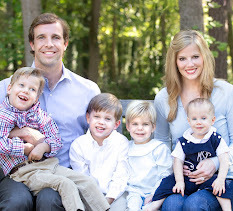 -for the transitions we will face in Atlanta: Meade’s business, getting things in place to start up again with John’s home therapy program, connecting with friends and family, finding a church home, etc. Too sad! But, very excited for you. You will be missed terribly every day. And, short trips to Atlanta are in my future!!! !